It’s just Bear Grass crazy out there this year! 8AM start from Polebridge after some wheat treats and coffee. Pedaled the last 74.9 miles of the JCPR – Tour of the Whitefish Divide with Phillip and Jim who are doing the official rid on the 29th. From Plolebridge to the Whitefish Bike Retreat came out to be 74.9 miles and a bit over 6400′ of climbing and 6900′ in descending. Moving time was about 7 hours at a moderate tempo with lots of chit-chat. Total time was about 8:15 hours:minutes and we ran into two separate groups of folks who we socialized with, picture stops, numerous water stops and a long stop at the Olney Store for a Coke in a bottle. Great day for a ride and staying up high to beat the heat, until the last 20 miles or so. Milage given in total route miles from zero. So, the fisrt couple miles out of Polebridge is flat and a good lead in for the 5 mile climb leading over the Cyclone Lookout Pass, straight forward with an average grades of 6.5 percent. The gravel life is good. Heading down to Coal Creek. Miles 80-88 takes you down to Coal Creek, take a left. Lot’s of water on this section and a short climb in the middle. Descent of about 1200′. Miles 88-95 is a rolling affair with short low grade climb in the middle before descending down to the Big Creek Road junction, where you take a right. If you need water, you will cross Coal Creek. Rolling through the Coal Creek Valley. Miles 95 – 117 take you up Big Creek to Four Corners, across the Whitefish Divide and up to the Top of Werner Peak. You are going form 3500′ to 7000′. At mile 102 or so, be sure to stay left on FS Road 316/Big Creek, and continue past the closed gate(this road opens to vehicle traffic on August 1). At mile 111 be sure to stay right at the “4 Corners junction. The first 10 miles or so is a pretty mellow cruise, the next 10 has some steeper pitches up to 7 percent and the the final 1 1/4 mile up the Werner Lookout spur road gains close to 700′ in vertical with the steepest grade of 14 percent in the last 1/8 mile. I rode all but 100′ lineal or so of the Werner climb, just easier to hoof it on the 14 percent section. I was pedaling a 1x – 38/42. Big Creek, take a right. Stay left on Rd. 316/Big Creek. Bear Grass craziness atop the Whitefish Divide. 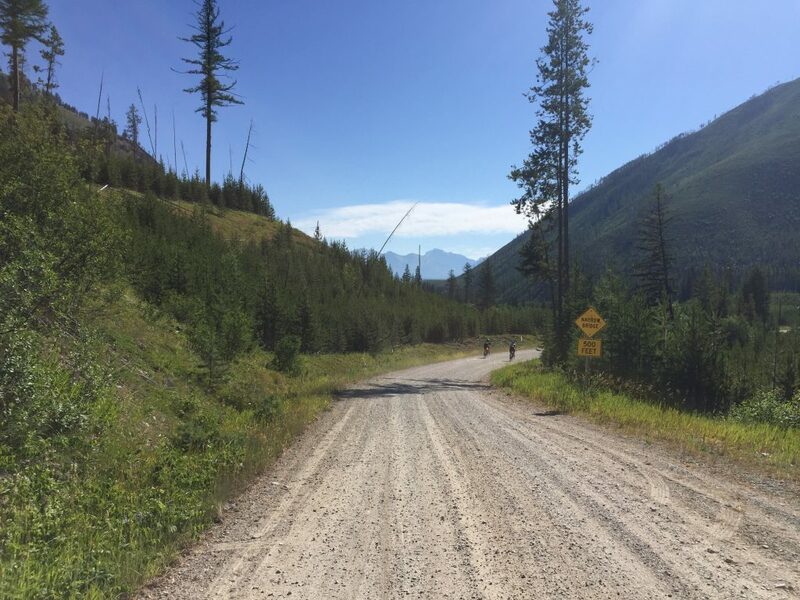 Miles 117 – 123 takes you down to the Upper Whitefish Lake Road. Super bumpy and rocky section, with some big road craters. Lot’s of water on this section. Miles 123 – 125.5 is just a short rolling section on the Upper Whitefish Lake Road to the junction of the Olney Cut-Off road, take a left. You cross one creek if you need water. Miles 125.5 – 134.5 covers the Olney Cut-Off Road. Mostly at a slight down hill grade with a short up and some flat. This is a well traveled gravel road, so I am sure you could see some moderate traffic on this stretch, and just a warning, if it’s dry, it will be super dusty. Caution HWY 93 Crossing. Miles 134.5 – 136.25 are paved and take you through Olney. The Olney Store is open till 7pm and a Coke could taste mighty fine at that point. Bit of down and a short ramp back up to HWY 93. You’ll want to take a left. Miles 136.25 – just a 136.75 short hop on HWY 93 to get onto the Lupfer Road. Take a Right on the first road(not signed) after you pass under the railroad overpass. Don’t follow any arrows, pink or other wise, the JCPR route is not marked. Miles 136.75 – 142.5 Lupper Road, Short climb and then flat and rolling. At the end, take a right, cross the rail road tracks and then take a left on HWY 93. Miles 142.5 – 147 HWY 93. If there is even the slightest possibility that you will be out on the route past twilight, you need to have a tail and front light as required by Montana State law. This stretch of highway is pretty straight and has good visibility. However the speed limit is 70mph. It’s the main travel route between Whitefish and visiting Canadians. Please be safe. Mile 147 – 148.9 Gravel it on up to the Whitefish Bike Retreat and have a beer and pigs in a blanket. HA! you made it. You may notice that the final milage came out to 148.9. Putting together the all three of the training ride gpx files, this was the total sum. I’m sure there are some variances in the milage and elevation data, so please don’t expect these to be exact. The milage and associated directions are approximations and with a map, cue cards and whatever cycling computer/gps unit you may use, you should be able to figure it out. Make America Great Again, a Rainbow, Beers and Burgers at the Northern Lights Saloon.Route Info.